I'm post dating this, because one of my goals this month is to write a Family Days post for each family member. I've been spotty at best with this effort recently and I want to be better this month. During the school year, Addie and Geoff attend a Korean language and culture school most Saturdays. 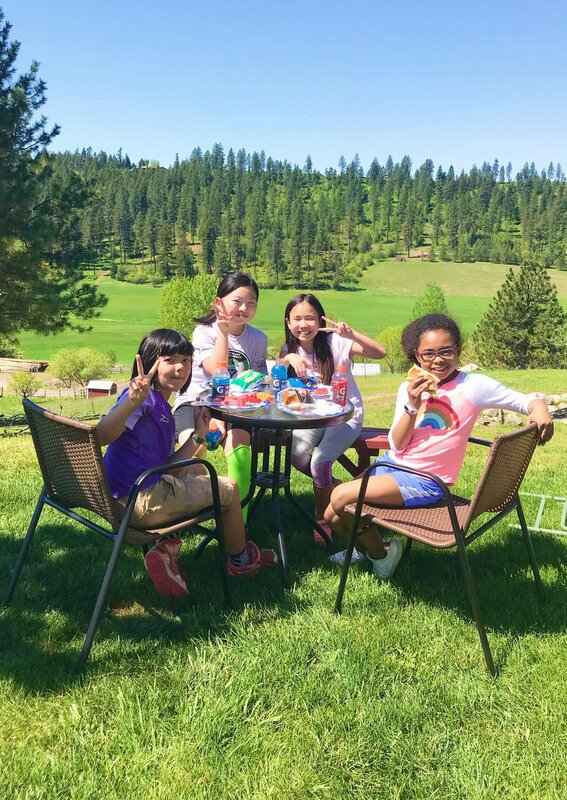 This was their end of year picnic at her teacher's amazing house/farm. Addie is BEST friends with Trey. They literally PLAY together every.single.day. On this day, we picked late raspberries and blueberries in the morning and then in the afternoon, they made mini pies. I'm LOVING the relationship that is developing between these two sisters. Here Addie is sporting what we refer to as a "Lauren bun" which when worn with her first pair of high-heels freaked me out a little. She is growing and even though she is little, she is developing into a beautiful young woman. This is Addie's first day of school pic, wearing the shirt I wanted her to wear. When I pressed her, she submitted at rather mature solution. "Mom, why don't I wear the shirt you want me to wear for the pictures and then I can change and wear the shirt I want to wear to school." I can't argue with that. Addie has some pretty significant learning challenges, but she LOVES to learn. She doesn't love school, but she uses YouTube almost daily to teach herself something new and she is frequently watching documentaries. She has almost no number sense, but a keen sense of humor. She cannot remember her multiplication facts, but she can remember all sorts of interesting facts about ball pythons. She has been studying snakes in preparation for taking over the pet snake care taker role, when Trey leaves on his mission in two weeks. Addie is bright and vivacious and helpful and kind. I'm definitely keeping Addie.